What Would Wilma Maples Think? Each step of a lighthouse keeper told a story. From land to light and back again. His symbol, the lighthouse, told one, too. 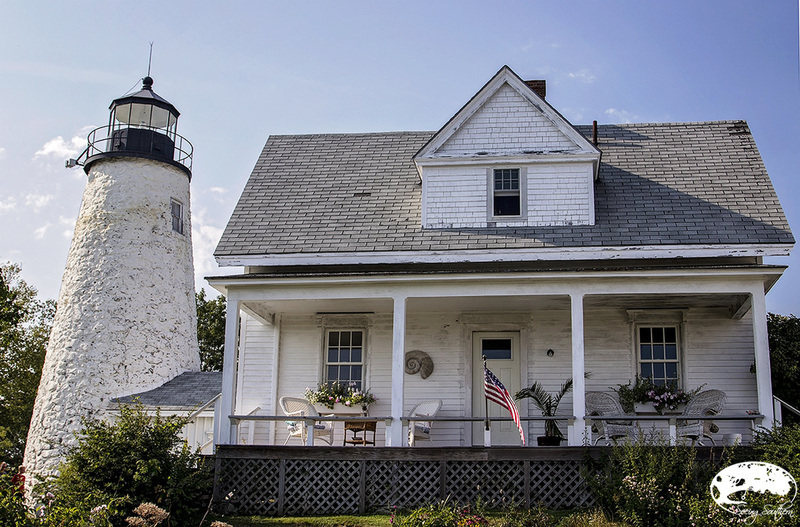 Along the 5,000 miles of jagged Maine coastline and its nearby islands are 65 historical lighthouses whose stories have weathered the test of time and remain standing today. It was obvious during our trip to Maine that we weren't the only people drawn by the lure of the lighthouse. From the south to the north along the coastline, we paused with many of the same travelers, walking around, observing and taking note of its history and beauty. For as many that were accessible by land, there were many whose only access or view was by sea. Through sunshine and extreme fog, we photographed these beacons that once played an important role in the everyday life of mariners; many light stations are still operational while some have not weathered time or necessity as well. Possibly a lesson for the ages, a light head's existence has remained a majestic symbol even through isolation and automation. Keepers and caretakers have disappeared; the Coast Guard no longer requires their service for many reasons, some understandable. Now, it is the community who must come to the rescue. Look below at the Rockland Breakwater Lighthouse. When it became fully automated in the 1960s, a discussion followed about tearing down the structure and replacing it with a lightpole. A lightpole. In Mackinaw Island, Michigan, the St. Helena Island Lighthouse was abandoned in 1920 and remained that way until a restoration project began in 1986 by the Boy Scouts of Ann Arbor. There's even a doomsday list of the most endangered lighthouses. And to this list of names, you must add the millions of dollars needed for restoration. Not a light task for one who is simply drawn to history. The one most northern is found across the border in New Brunswick. We made our way to the path that led to the East Quoddy Light (Head Harbour, 1829). Rain and fog poured in. Inside a shack at the top of the hill sat a volunteer, eager to share the story of East Quoddy. She told us about how it was low tide now, so we could make our way to the small group of islands which we couldn't see. We even had to take her word that a lighthouse stood in the distance; we couldn't see 20 feet in front of our feet. Then, the fog horn sounded. "The water rises five feet an hour" once the tide changes and begins to rise, and if you don't pay attention, you'll be stuck and have to wait the entire day. It was the town and the Friends of the Head Harbour Lightstation organization who took back East Quoddy from decline, raising money for restoration (thus the $5 charge to visit the islands, $10 to see the keeper's house - 1840) and hoping that one day visitors can stay the night in the keeper's house. When they began restoration, explains one of the volunteers as he shares a scrapbook of photos, it was boarded up. Membership for Friends is a mere $35. They accept donations and welcome visitors daily, even during the fog. Like the lighthouse with the signature St. George cross daymark, they are in it for the long haul. For nearly 200 years, it had guided ships entering the Passamaquoddy Bay, naviagating through dense fogs, high tides, treacherous rocks, rocky cliffs and shoals. The National Historic Lighthouse Preservation Act of 2000 provides for the disposal of Federally-owned historic light stations by transferring them at no cost to Federal agencies, state and local governments, nonprofits, educational agencies or community development organizations. These must be financially able to maintain the historic light station and then make it available for education, park, recreation, cultural or historic preservation purposes to the general public at reasonable times and under reasonable conditions. Only those determined eligible for listing can be disposed. Light stations not eligible for listing will be disposed of through other processes (auction or donation). The National Park Service provides lists of lighthouses that are available. All properties are offered "As Is" and "Where Is" and must be maintained in accordance with the Secretary of Interior's Standards for Rehabilitation. Most are on the National Register of Historic Places. Located in Cape Elizabeth, Maine and along the shores of Fort Williams Park, Portland Head has been standing tall along the coastline since 1790. Commissioned by George Washington, the original tower was 72' from base to lantern deck and was lit with 16 whale oil lamps. The first lamp was lit on January 10, 1791. The first keeper's dwelling was erected in 1816. It was decommissioned by the Coast Guard in 1989 and the property finally deeded to the town. Today, the Coast Guard maintains the light and fog signal, but the remainder of the property is managed by the town. 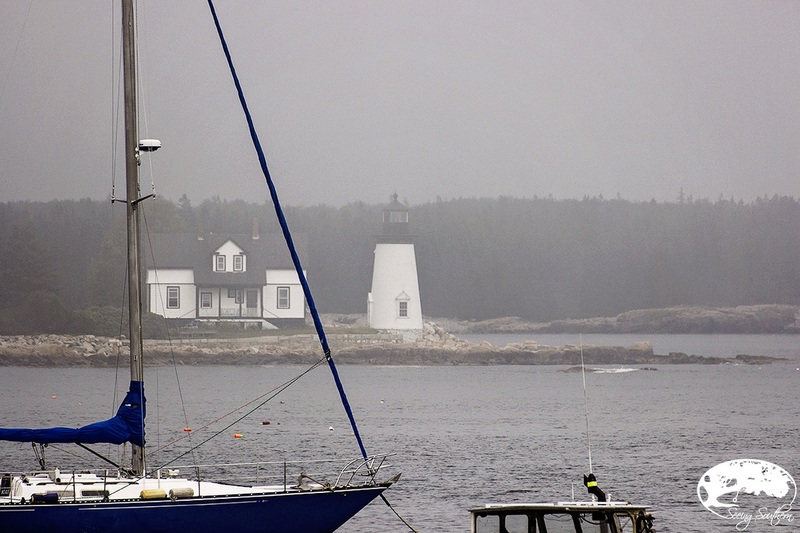 Located mid-coast Maine, Marshall Point leads the way into the fishing village of Port Clyde. Like most lighthouses, it is open from sunrise to sunset year round. Visit the museum which tells of its history. Most notable, the stop on Forrest Gump's cross-country run. OWLS HEAD: Built in 1825, its short brick tower (30 feet) sits atop a steep climb from the keepers house. 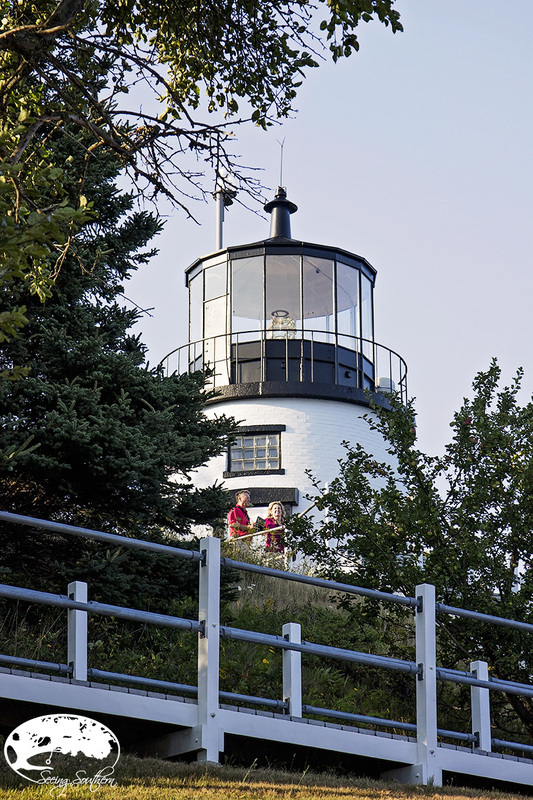 It is located in Owls Head State Park (near Rockland) and is an active aid to navigation and number one on the haunted lighthouse list. 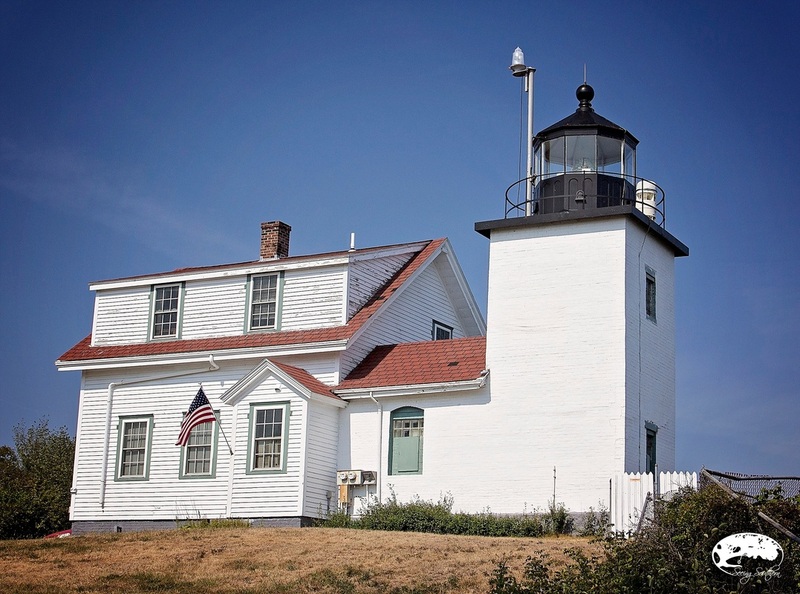 DICE HEAD: Located near the beautiful city of Castine settled in 1613, the lighthouse is privately owned but the grounds are open during the day. Built in 1828, it was discontinued in 1935. 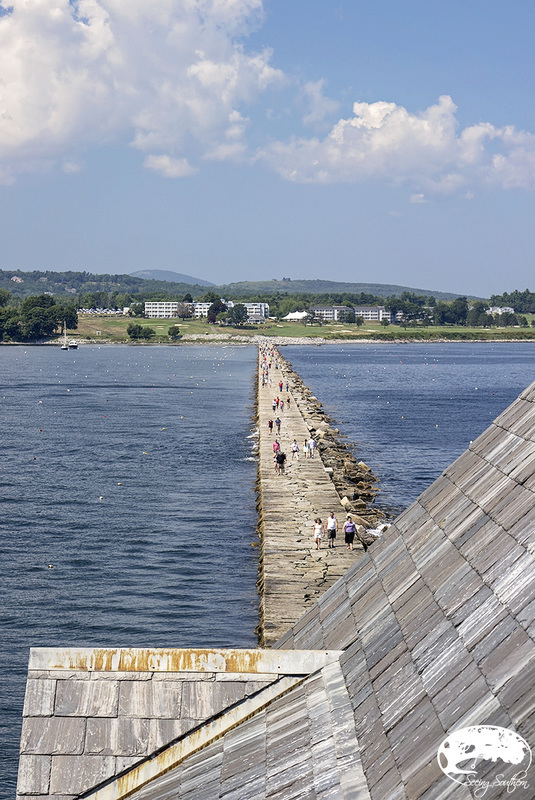 ROCKLAND BREAKWATER: Amazingly, the near-mile long breakwater (app 760K tons of stone) was built before the lighthouse. With intense work by the Town of Rockland, restoration continues on the keepers house, which is open most Sunday afternoons. Fort Point Light is located in Fort Point State Park on a small peninsula at the entrance to the Penobscot River. 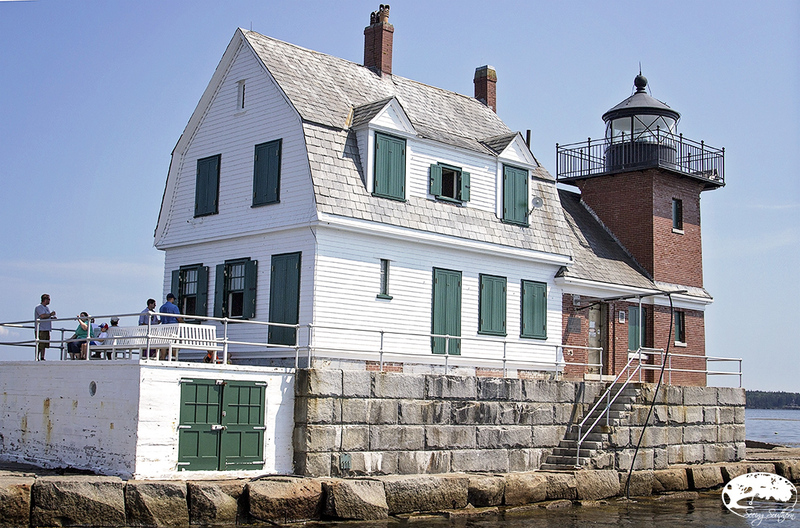 Built in 1836, it was the first river light in Maine. It remains active to navigation. BASS HARBOR: Built in 1855, this 56-foot lighthouse sits at the mouth of Bass Harbor and located in Acadia National Park. It is a private Coast Guard residence, but you can get close to the part of the grounds. It is active to navigation. BEAR ISLAND: Located in the community of Cranberry Isles, the 31-foot light station was built of brick in 1889. It is visible from the water and is closed to the public. 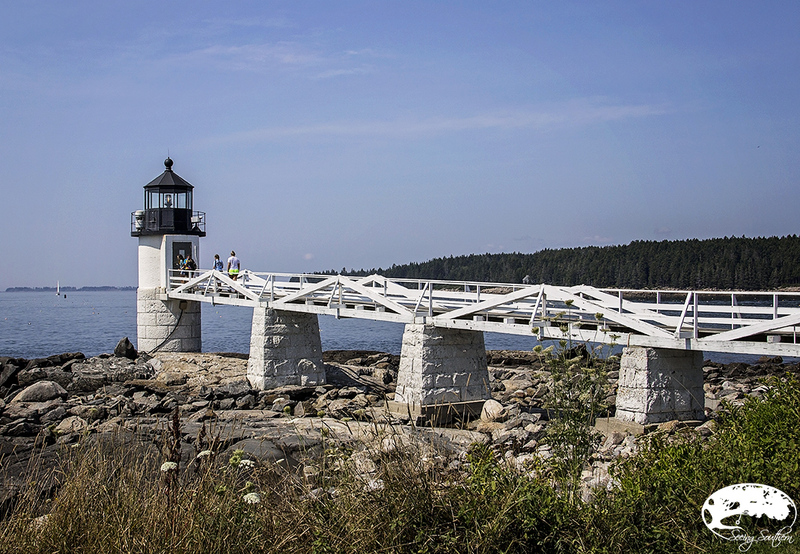 Located in the village of Prospect Harbor, the light station watches over lobster boats and other vessels.This is the last point on the Schoodic Scenic Byway through Acadia National Park. It is also on the ﻿haunted lighthouse list﻿. Located in Lubec, it is the easternmost point of the contiguous United States. 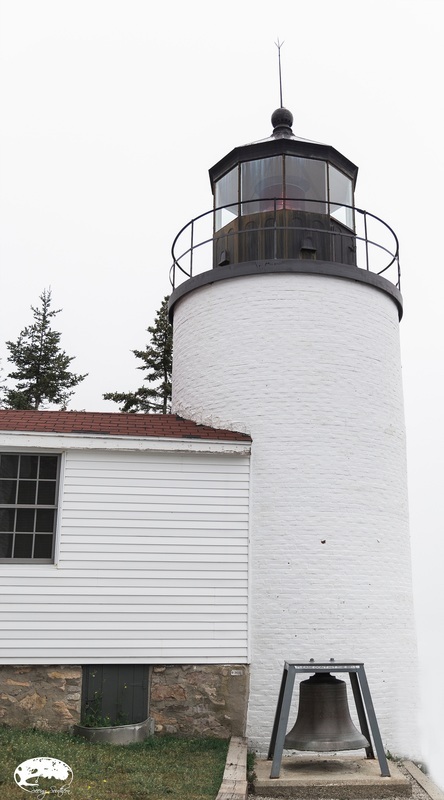 West Quoddy was built in 1858, and is one of only eight Fresnel lenses still in use on the Maine coast. It was first illuminated by oil from sperm whales, then lard oil in 1860; then kerosene in 1880 and electricity in 1932. 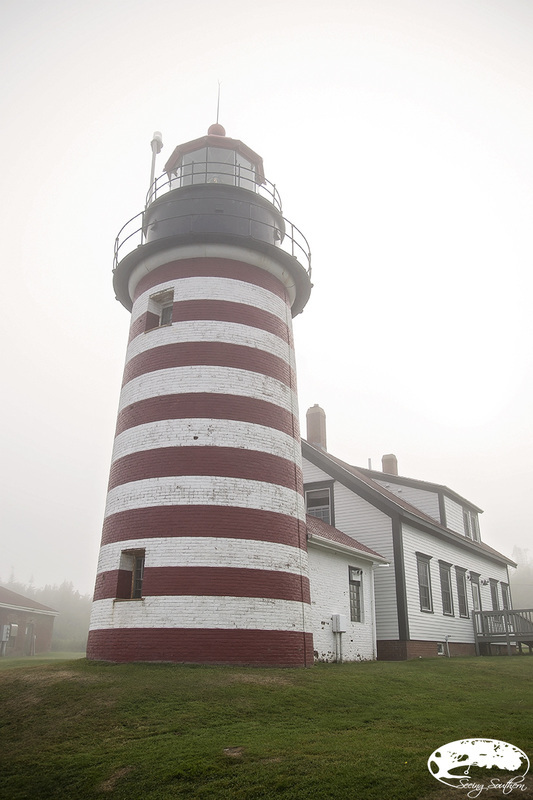 It is considered to be Maine's most recognized lighthouse due to its bright red striping. The visitor center is open daily until 4 p.m. It is still used as an aid in navigation. One of the most isolated of them all, East Quoddy or Head Harbour sits on the eastern tip of Campobello Island, New Brunswick. Talk began in 1829 of a lighthouse to warn sailors of jagged cliffs. Then as now, the lighthouse and quarters are only accessible at low tide. It was decommissioned in 1986, and it is now because of the volunteer work of the Friends of the Head Harbour Lightstation that the structure remains. 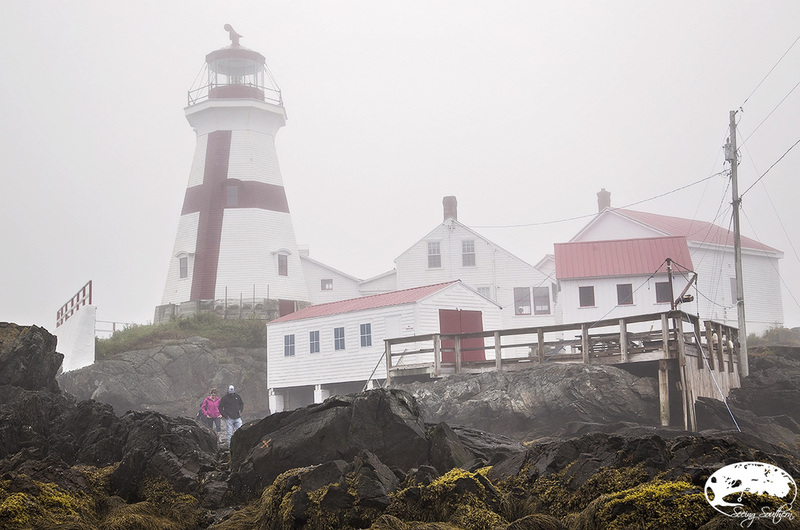 It remains one of the best whale watching locations on Campobello Island. You will need a passport to visit this lighthouse. 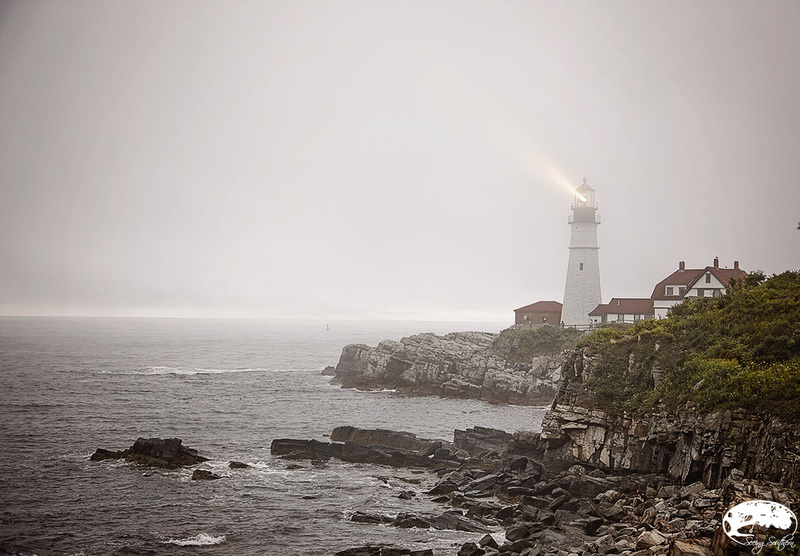 Maine Lighthouses: Illustrated Map & Guide. Robert Hartnett. Excellent addition to travel books. Fold-out map with history as well as directions and suggestions. 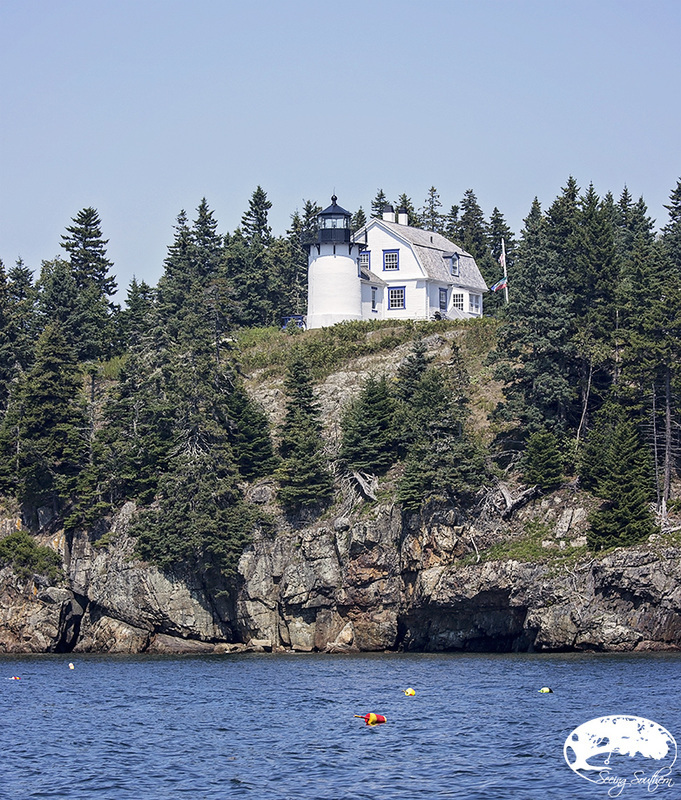 Explorer's Guide Maine Coast & Islands: Key to a Great Destination. Nancy English. Excellent resource with out-of-the-way adventures and up-to-date observations. ©2013-2019 Seeing Southern, L.L.C. All images and text appearing on this website are the exclusive property of Judy and Len Garrison d.b.a. Seeing Southern, L.L.C. unless otherwise stated. Two Coots Travel, Judy Garrison Writer, Seeing Southern Photography, and Full Circle Fotography are part of Seeing Southern, L.L.C. without the written permission of Seeing Southern, L.L.C.